Hello. I'm Dennis Kang, Centre Owner of Mathnasium of Aurora, your neighbourhood math-only learning centre. We help kids in grades 1-12 understand math by teaching the way that makes sense to them. Dennis and the teachers make the kids feel comfortable or enjoy math more. Great team, well organized and more importantly I see result with my son. I love how the kids are learning different ways of solving problems. Great job working with kids and always accessible. Highly recommend to any student needing assistance in math. Keep up the great work! My daughter says “The tutors are fun and very nice and caring,they teach very well. The games are fun and entertaining and I absolutely enjoy my time in Mathnesium”. I say, the hours of operation are convenient as u drop your kid any time. My daughter Is able to use the skills she learns in mathnasium in her daily life and in school... “now I can solve problems easily, am connecting the dots”. It's an amazing centre to foster a greater math ability and helps in building a solid math foundation. The director, Dennis Kang, strives for student success and tutors are well trained to deliver personalized and individualized learning support to students. My daughter's academic performance has improved after filling in missing gaps and now building for stronger knowleage. My daughter loves coming here. My daughter enjoy coming to Mathnesium! Her attitude toward math has improved as well as her math skills. The hours of operation are incredible. It allows both parents and children to go anytime. Personally this is an advantage over other learning centres. Thank you Mathnesium. Very friendly staff who knows how to teach and get kids attention. My kid is looking forward to going to Mathnasium of Aurora every day. Has been such a great confidence booster for my son, the teachers have been wonderful and we have seen real progress in just 3 weeks. So glad we discovered Mathnasium. My sons experience at Mathnasium was phenomenal. My son has been getting straight A’s in math at school but we had won a voucher for one month there and decided to give it a try. They showed me where the public school education system lacked by showing my son how numbers can be done faster mentally and efficiently. Also problem solving was broken down to make it easier to understand. Mathnasium is a One to one ratio. This system is great for kids to catch up, review or get ahead. Bec my son has so much on the go during the year (like Intense sports training) I will I def will be coming back next summer to get my son ahead. Great staff! Very helpful and encouraging. My daughter really enjoys going and is gaining lots of confidence. Elsie enjoys every Mathnasium visit and is excited to attend. We are so grateful for warmth and kindness of the team at Mathnasium. Our son’s confidence in math started to improve almost immediately and gets stronger every week. He loves his sessions and his enthusiasm is the best outcome! Kids always come out smiling and telling me that they learned something and that the people helping them are so nice and helpful. It has really helped their confidence when it comes to math and that it isn’t something to be afraid of and can actually be fun. The tutors are fantastic. Mathnasium has really pushed my kids to learn math beyond what is being taught at school. Such a wonderful environment and welcoming. My kids really enjoy the people working there and it has definitely improved their self-confidence. My daughter enjoys going each week. She likes how you combine the learning with games. Helping her make learning math fun is a priority and you have done that. Thank you! Our Kids still look forward to coming to mathnasium. And they’ve really changed their attitude towards math! Very good tutoring. Respectfully executed. We have had a great experience at Mathnasium. The one on one support and the flexibility of the program to cater to the topics that are being covered at school is wonderul. 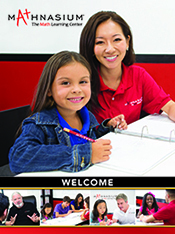 Excellent tutors who all are fantastic with the kids. Very engaging and positive atmosphere. Just want to let you know that my son enjoys his time there and really likes the staff. You guys were great ! We couldn’t have done it without your help! Thanks so much! Mathnasium Aurora is a bright, open environment allowing my child to stay stimulated and interested. It is a non intimidating culture and also offers a lot of flexibility with drop in and structured learning. My child’s tutor is very supportive and caring. We have been very happy with Mathnasium. Mathnasium has been wonderful! My daughter now has confidence and has shown motivation when it comes to math. Very very pleased with their detication And hard work! We love it and more importantly my son loves it! My son in grade 8 joined Mathnasium in September 2017. After couple of sessions I noticed very good progress on his math skills. He enjoys the sessions and now with building some good foundations, he has more confidence. The customized learning plan for each student is very helpful. Very happy with our decision to join this centre. Great tutors! Is "Discovery Math" a Failure? Prevent Summer Slide! Call for details about our Summer Offering.